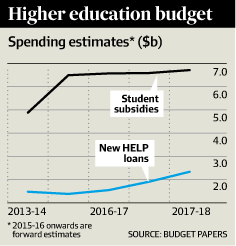 Crunch time has arrived for the government’s higher education reforms. Having passed in the House of Representatives, the legislation is now being kicked around the Senate like the football it has become, having been referred to a committee. Geoff Sharrock (LH Martin Institute) at the policy trade-offs that might be necessary to get the package through. The accompanying table shows the package as a balancing act of spending and saving. Politically, the odds are stacked against the three major reforms: higher HELP loan interest rates (Policy 7), cuts to the amount of public subsidy (Policy 6) and fee deregulation (Policy 5). Universities Australia has called on the Senate to support fee deregulation, keep loan interest charges linked to the consumer price index rather than the bond rate, and moderate subsidy cuts “to reduce upward price pressure on fees”. Education Minister Christopher Pyne’s dilemma is clear. The two main sources of budget savings – higher interest rates and lower subsidies – each amplify the risk of larger HELP debts, undermining support for fee deregulation. Yet without savings the other spending measures will exceed the budget bottom line. In the Senate a spectrum of positions can be found. Some are utopian. Free higher education, a world away from decades of Labor and Coalition policy, is sought by the Greens and the Palmer United Party. If adopted, an analysis by the Group of Eight universities sees this adding $5 billion a year to the current $6.6 billion spent on subsidies. Apart from fee deregulation, most spending measures in the table have wide support, Policy 1 in particular. While not a reform – it retains Labor policy to let institutions offer subsidised places without limit – this is a costly decision. As the graph shows, even with subsidy cuts, the budgeted expenditure for grants plus HELP lending rises from less than $6.4 billion in 2013-14 to more than $9 billion in 2017-18. Meanwhile, on official estimates, the savings reforms cut public spending by $3.9 billion over the three years to 2016-17. Among these, Policy 7 faces wide opposition. A paper by economists Bruce Chapman and Tim Higgins shows how higher rates of interest on HELP debts hit lower-income graduates hardest. They say a 25 per cent surcharge on HELP loans, indexed at CPI, would leave this group better off than a 5 per cent or 6 per cent bond rate. However, the minister can’t abandon this reform readily: if applied to old HELP debts as well as new, it offers big savings. And the 25 per cent surcharge idea has three problems. It can only be applied to new HELP debts. It penalises those who elect to pay debts off early. And modelling by the Group of Eight shows that if the bond rate sits at about 4 per cent or less (as it has for the past two years), all graduates are worse off with a 25 per cent surcharge. A compromise would be to index HELP debts at CPI plus 1 percentage point. This would limit the compound interest risk to students, bridge much of the gap between the two rates in recent years, and create an incentive to repay debts sooner. Similar problems arise with Policy 9. To lift real revenue by 20 per cent universities must raise prices 25 per cent to allow for scholarships, taxing the many to support the few. Since many institutions tap private donors for scholarships, and others have little scope to charge more, the policy is inflexible for some and ineffectual for others. Apart from interest rates, the other main risk for students is that universities lift prices 30 per cent as a first step just to offset lost revenue from subsidy cuts under Policy 6. Without this reform, fee deregulation would pose less risk to students (and taxpayers). But again the minister cannot abandon cuts easily: they reduce direct spending by perhaps $1.5 billion a year once new students replace the current cohort. The best and fairest alternative to subsidy cuts is to tackle the budget cost of unpaid HELP loans. The budget estimates expect that 20 per cent to 23 per cent of new HELP debts will never be repaid. Expensed each year under accrual accounting, this cost is projected to rise to $2.3 billion in 2017-18, mainly due to a policy that cancels unpaid HELP debts when debtors die. The case for treating these like other unpaid debts, recovered from deceased estates, was made in a Grattan Institute report in April. The budget papers don’t say how much HELP lending is expected each year. A rough estimate is $6.7 billion in 2014-15, rising to $10 billion in 2017-18. On this outlook the immediate budget saving of a deceased estate policy at a 50 per cent rate of recovery, could be $2.8 billion over the three years to 2017-18, at zero cost to graduates in their lifetimes. At 67 per cent recovery – the high end of Grattan estimates – savings could be up to $3.8 billion in that time. Without the subsidy cuts in Policy 6, HELP lending may be less than estimated. If so, the savings will be less; but still large enough to replace subsidy cuts, and lower substantially the costs and risks of fee deregulation for students. Senators should ask: what would students prefer? 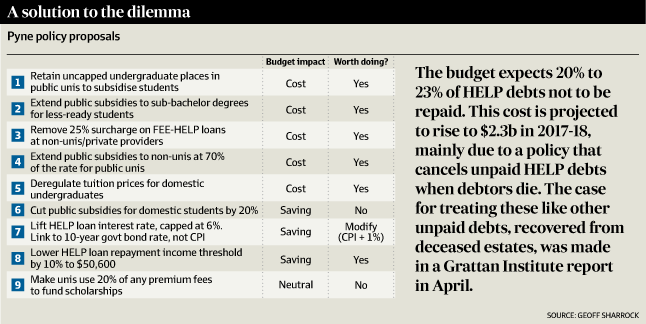 Higher fees and HELP debts tomorrow, to pay for subsidy cuts today? Or lower debts they expect to repay anyway, taken from their estates 60 years hence? If, as Labor’s Kim Carr says, the package must “go back to the drawing board”, these options could give universities pricing flexibility without undue cost to students or the budget. This opinion piece was first published in The Australian Financial Review on 8 September 2014 (updated 15 September). The ideas are more fully expressed as “A memo from Machiavelli” on the Institute’s website.